Ideas can come from anywhere and when inspiration hits, sometimes you take a leap of faith and go for it. After a dining experience left him unsatisfied, founder and Servy CEO Robert Edell was tempted to leave a scathing review online, but decided not to. Further research in the Mystery Shopping practice found that many restaurants pay hundreds of dollar for a single evaluation. So, Edell, together with cofounder and CTO Julien Wormser, created Servy, a mobile app that allows frequent diners to complete private restaurant evaluations in exchange for partial reimbursement of a meal. Reimbursement of a meal, according to Edell, is cost-effective for restaurant clients and ensures that consumers are evaluating the right restaurants. So far, they have been working with over 80 restaurants in New York City such as Hale & Hearty, Just Salad, and Park Avenue Summer. However, they do enable users to evaluate restaurants that Servy is not partnered with. Ever since their launching 6 months ago, Servy has already had 4,000+ evaluations completed to date. “That’s a big thing our users like, is that they want to impact the restaurants that they dine at and frequent,” says Edell. Restaurants pay per Evaluation completed, but at a significantly lower rate compared to traditional mystery shopping. They can also get a subscription and pay a monthly fee. “It also enables some of the higher-end restaurants to profit on a Servy evaluation,” Wormser says. Which is pretty unique within the industry. Meanwhile, on their Servy, restaurants not only see the feedback from individual diners, they also see trends in the restaurant business. For example, they may find that plenty of other restaurants fail in the upsell strategy, such as offering a drink and a side, or employee friendliness is on the low. They can apply this knowledge to improving their service. 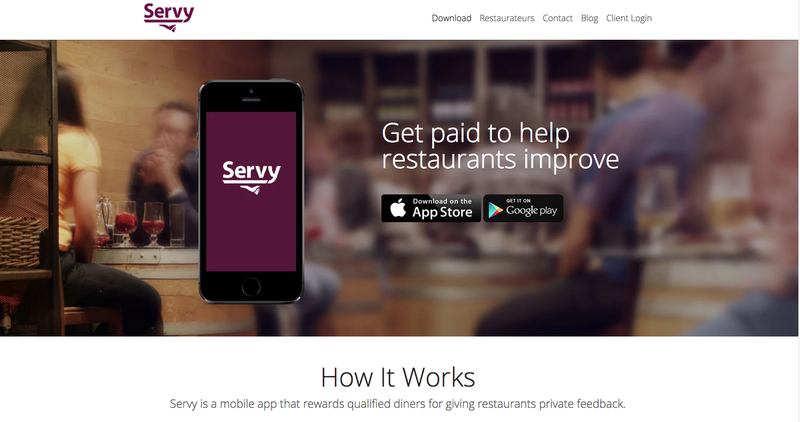 Servy also ensures that restaurants do not receive fake reviews. Evaluations are structured, so only relevant questions that a specific restaurant wants are asked. Feedback is sent directly to the restaurant and is completely private. Users also have to provide a photo of the receipt, not only to verify that they were at that restaurant, but to also provide context such as date, what they ordered, and who provided the service. In addition, for every evaluation, Servy donates a meal to charity. So you not only get a discount on a meal, but also help others in the process.